You can read Ms. Chockylit's recipe right here. Pretty! 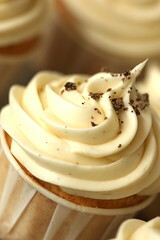 That frosting looks really creamy and the vanilla sea salt is an interesting twist. Very interesting combo. Where do you find vanilla sea salt?